This product has been popular for a while now, winning several “Product of the year” awards in the home appliance category as well as winning several “Which?” best buy awards. 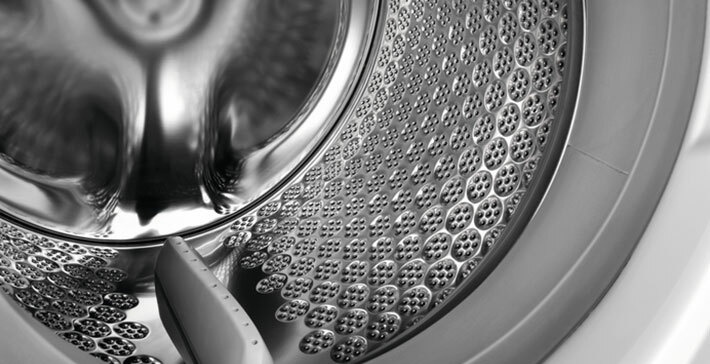 But what is it about the AEG L9FEC946R Washing Machine that makes it so well loved? 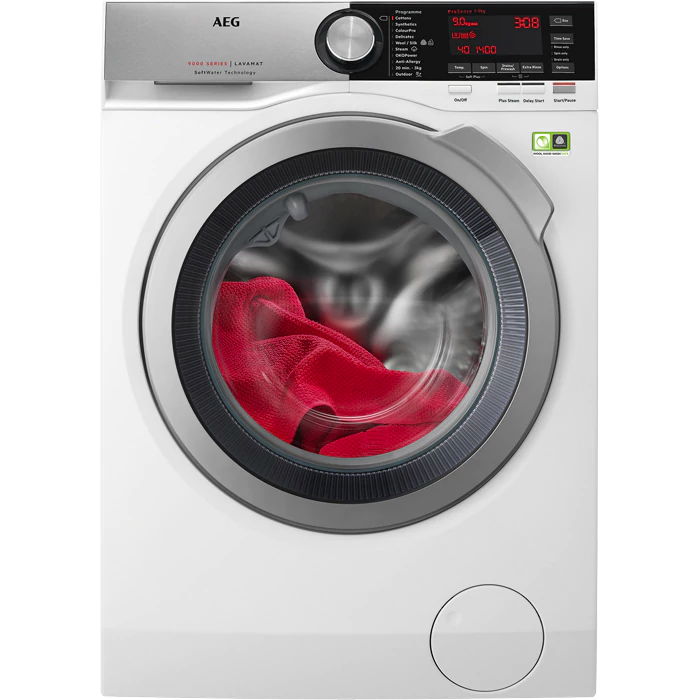 Here is our AEG L9FEC946R Washing Machine review. The machine itself is a stunning looking unit, stainless steel and black trim with a nice clear red display. It has a silver and black door, and the body is made from a good quality white enamel. It is a 9kg washer with a 1400 spin speed, rated A+++ for efficiency (so it’s ultra-efficient). The noise level on the standard wash is just 47 decibels. Though it does briefly go up to 73 decibels for the final wash (but that’s only for 30 seconds to two minutes whilst it’s spinning out and doing that final dry). It has an easy to reach door, with a 45-degree handle. And a nice solid hinge that closes very firmly and clearly. 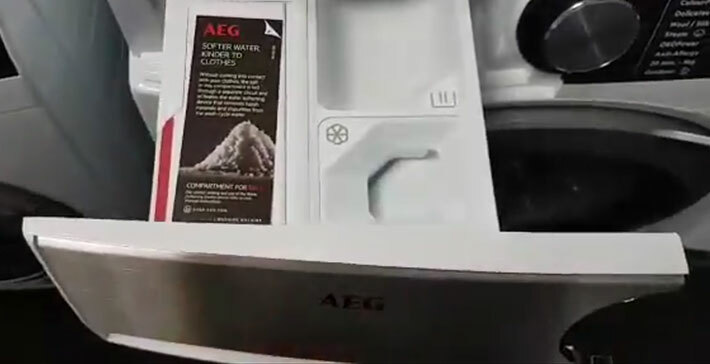 The detergent drawer has 3 containers, the first container on the left-hand side is for salt, as this washing machine features soft water technology. This purifies and softens the water allowing it to give you a 60-degree quality wash at just 30-degrees. This keeps your fabrics shaped better, makes them last longer and makes them fade less. Plus, it is also good for making the machine last longer as well. The way this washing machine handles detergents is truly outstanding, as it ensures every fibre receives the same amount of detergent, giving you a better wash that’s going to be safer for the fabric as well. 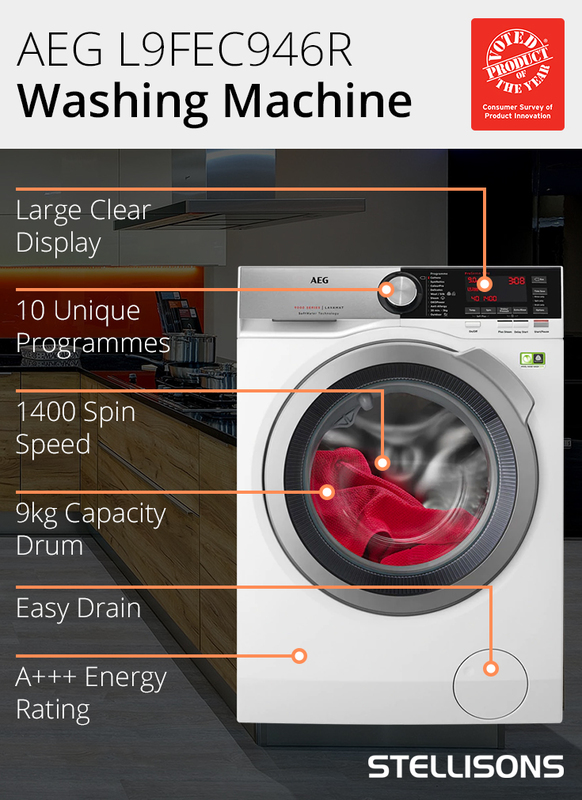 The AEG L9FEC946R Washing Machine features a nice red on black contrast display, which is great for anybody with visual problems, as this should be easy to read. It’s clear, it’s bold and the numbering is large as well! The dial has a nice solid click to it (you can really tell this is a well-built German machine) and the LED light moves down the display as you turn for each program. This machine has a variety of programmes to handle almost any type of laundry. The Cottons programme gives us a full 9kg load at the full 1400 spin. The standard Cottons program lasts 3 hours 5 minutes. We also have an Eco option as well which makes it last three hours and 24 minutes, so it takes longer but it is more efficient. Synthetic materials are very popular with sporting clothes and this programme is great for washing away sweat and dirt. This programme has a much lower washing temperature and a much slower spin speed so if you’re really concerned about colours this programme is perfect for you as it was designed specifically not to fade your fabrics. The world’s leading authority on wool (Woolmark) has certified this programme as gentle enough to wash woollen items. That’s right! You can even wash your “hand wash only” woollen items as this programme washes wool as soft as you can wash wool by hand. The steam refresh means you can quickly wash a shirt in 25 minutes, it will remove any odour and will be ready to wear straight afterwards. This is an absolute godsend for those times when you need a certain item of clothing clean fast (you often won’t even need to iron them too)! This programme gives you outstanding cleaning results within an hour, whilst using minimal energy during the cycle. This programme can be a life changer for people who suffer from asthma or skin issues such as eczema or psoriasis. The anti-allergy programme removes bacteria and excess detergent from the fabrics, by giving your laundry an extra thorough rinse. This programme is designed to get mud and grass stains out of clothing. So it is ideal for jogging tops, football kits and rugby kits. It’s also worth pointing out that this washing machine has a steam option too, so we can add steam to these which is perfect for killing off bacteria, making this ideal for dog beds as well. Graham at our Ipswich store breaks down the key facts for the AEG L9FEC946R Washing Machine in the video below. You can buy the AEG L9FEC946R Washing Machine today at Stellisons with 100% FREE Delivery, backed by our price match promise.